Vindicator on Rhinon rungolle rakennettu piirityspanssarivaunu, jonka aseistuksesta löytyy ultimaattisin Space Marine asevalikoiman edustaja: Demolisher Cannon. Miniatyyri on maalaamaton ja toimitetaan kasaamattomana. Maalit ja liimat tulee hankkia erikseen. The Vindicator is a Rhino-based siege tank that boasts the most devastating weapon in the Space Marines' armoury - the demolisher cannon. The demolisher cannon is the weapon of choice amongst the Imperium's armies when faced with dug-in enemy infantry in a dense environment such as a cityfight or siege. The terrific blast unleashed by the detonation of the huge demolisher shells can bring down buildings in which the enemy take cover. This box set contains one multi-part plastic Vindicator. 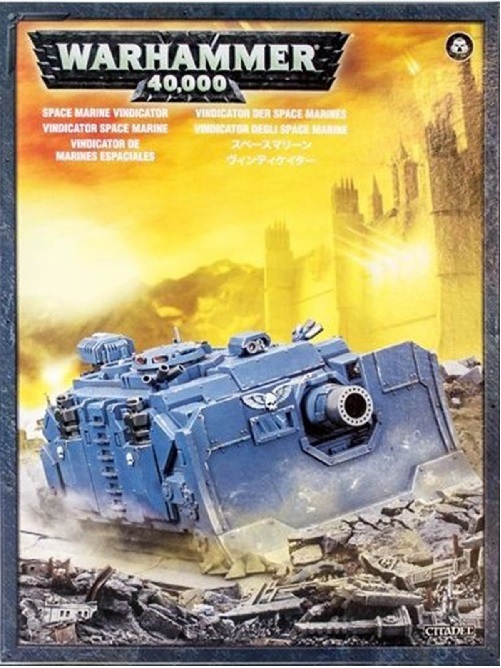 This 99-piece kit includes additional components to arm the Vindicator with a hunter-killer missile and a storm bolter, and can be assembled with either a closed hatch or visible tank commander.